Setting the alarm for 1:00 am is never a fun thing to do, especially not during a fortnight when Canberra experienced its lowest temperatures in two decades. So the first task was getting enough layers on – at least 4, in some parts five. Then coffee. Then drive. Drive to the rendezvous without incident (somehow part-way through the trip I found myself driving without the lights on). The ANU team run a seamless and professional monitoring program. On arrival at the Sanctuary about 16 of us were split up into four groups of four people, each group in a vehicle, and each group sent to a different part of the sanctuary under the leadership of an experienced team leader and 2iC (i.e. two staff and two volunteers on each team). Our team’s mission was to locate, clear and process animals in 25 traps through one portion of the sanctuary. To sample populations of nocturnal native mammals most traps are opened in the late afternoon and cleared before or soon after dawn on the following day. We systematically go trap-by-trap, ensuring that no trap is missed, so that no animals can be accidentally left in traps during the day. Across a trapping period (say 4 nights in a fortnight) the number of times animals are re-captured versus encounters with previously un-trapped animals gives an indication of the total population size (the key question). So it is imperative that every animal is scanned for its microchip, measured, recorded, and handled sensitively. An added complication with sampling these mammals is that the females often carry pouched young – requiring additional sensitivity. 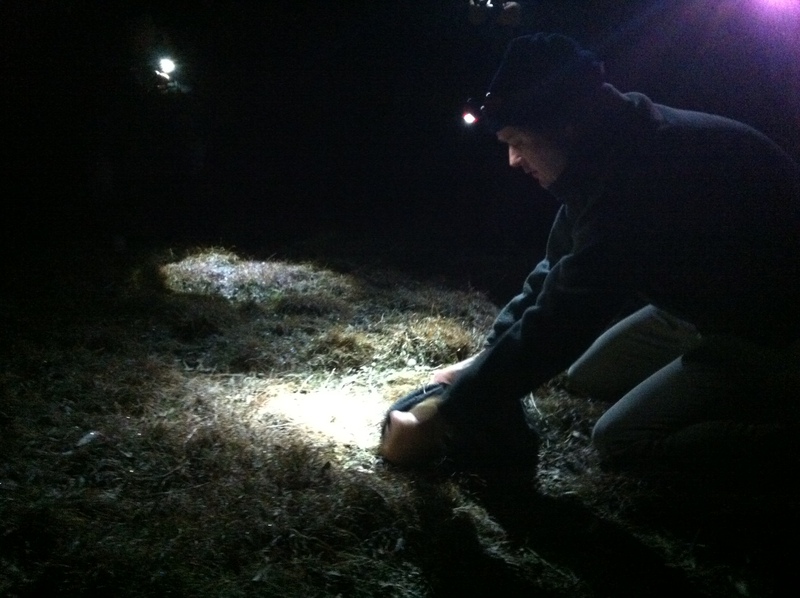 The first trap we encountered had a bettong, a great start to the night. By 2:10 am I had sighted for the first time an Eastern Bettong on the Australian mainland (I probably saw one as roadkill in Tasmania during a previous road-trip). Like any animal they don’t particularly like being handled, and it is with the utmost respect and professionalism and care that the ANU team handled and processed all the animals – even to the point of timing their handling to monitor effectiveness and efficiency through time. Releasing the bettongs is the best bit – for them and us. They are athletic – compact, strong and fast – and typically bound off like a terrestrial fire cracker. This struck me for two reasons – firstly as impressive agile animals in their own rite, but secondly, I was amazed at the challenge that foxes present to our native fauna if they can drive this species to extinction on the mainland (almost symbolically I had seen a fox sprinting across the highway as I travelled up to the sanctuary). I wondered whether that bettong was faster than the fox, and over short distances it probably is, but the fact it hides on the ground during the day is probably its main adaptive challenge. Our second trap had a magpie in it! A non-target species attracted to the peanut butter and rolled oats put out the evening before. 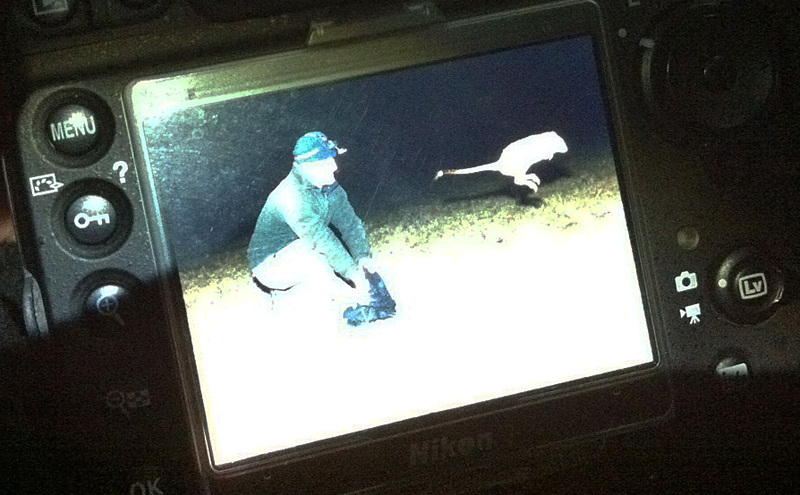 Easily released but a missed opportunity to record another bettong, and a missed opportunity for another data point. With a small papparazi in tow (two photographers) we worked through our traps as expediently as possible. The hours from 3-4 am were pretty cold. However, the views with a near-full-moon and tranquility of the environment of that time, and the special experience of engaging with these animals, more than made up for the hardship of frost-bitten fingers (I will wear gloves next time). During the evening I had the privilege of releasing a couple of male bettongs (handling females is reserved for more experienced handlers). Under instruction and close supervision I was handed the bag with a measured animal, and leant down and carefully unfurled the outside of the bag, with the bouncing bettong inside chafing at the bit to get away and return to its hide for the day. The explosion of the bettong leaving the bag and bounding back to nature provides a mixture of relief and amazement – relief that he got away safely and didn’t bite me or bounce into the bottom of my jaw on the way through, and up-close amazement at the energy, power and speed of the critter. In the end we worked through a complement of 27 traps – safely and carefully processing and releasing 17 bettongs, 2 brushtail possums and 2 magpies. Interestingly, the vast majority of the bettongs were repeat-offenders, coming back for more bait after being trapped earlier in the trapping fortnight. At about 5 am and 0.5 degrees celsius the four teams rallied back at the Mulligans Flat Sanctuary woolshed to pack traps away, share a cuppa, laugh over shared experiences, and struggle with the notion of facing the rest of the working day. Well done Team-ANU, it was awesome, follow their research the Mulligans Flat – Goorooyarroo Woodlands Experiment.